The Rural Sociology Group and Kyoto University maintain a close collaboration. Flora Sonkin, a MSc student at RSO, participates in a summer school and participated in field work near Kyoto this month. In this posts she shares her experiences. I arrived in Kyoto, Japan a few days ago as a visitor for the FEAST project at RIHN (Research Institute for Humanity and Nature), and to join the Kyoto University Graduate Seminar on Sustainability Studies. Being in Japan in autumn has a special effect on one’s senses. Feeling awakened by the warm yellow and red colors that paint the mountainous landscape, and by the fresh smell of fallen leaves and pine trees. On the first day of my visit, Mai Kobayashi (my host at the RIHN) took me to a Satoyama nearby RIHN, were a community-led forest management project is trying to regenerate a red pine forest – and hopefully matsutake mushrooms along with it. Matsutake are glorified in Japanese food culture for its aroma, and it is the most expensive mushroom in the world (a piece can cost around 200 euros). The economic and social value of this fungus relate to the fact that its growth cannot be planned. It only happens in very specific conditions of human-nature interaction, which include the existence of pine trees (matsu, means pine in Japanese). The woodlands are at the heart of the satoyama concept. Until around 60 years ago, they were routinely disturbed, and thus maintained, by people collecting firewood, making charcoal as well as gathering non-timber forest products (Tsing, 2015). Managing satoyama forests today, therefore, means systematic human disturbance of the natural environment. This requires an intentional interruption of forest regeneration processes. 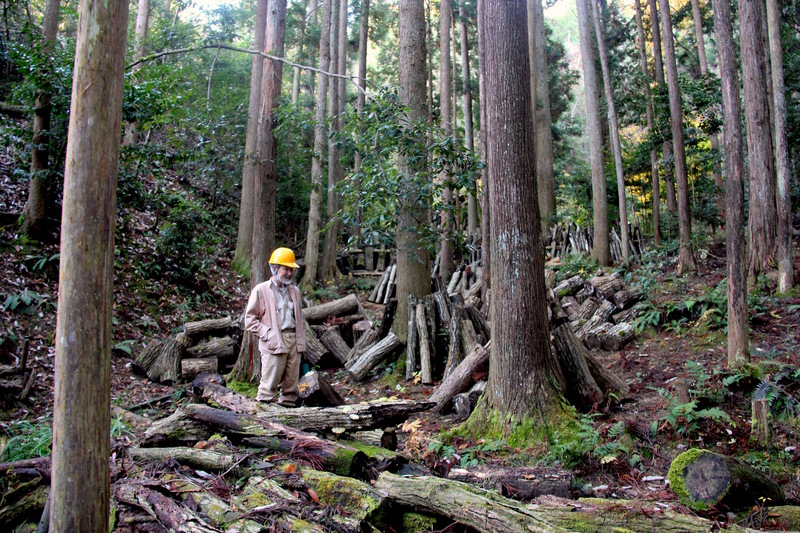 Humans, pines and matsutake are interdependent in their existence in the satoyama landscape. They are all part of the same unplannable but interwoven system, or what Anna Tsing would call an unintentional design. Matsutake could then be seen as a tasteful materialization of human management of satoyama forests. A lot of the current issues in satoyama regions are coming from a process of de-peasantization of the Japanese countryside and the change in the source of fuel after WWII. This led to the under management of the densely-planted tree forests, preventing undergrowth shrubs to take root, animal species to find habitat, thus contributing to the overpopulation of wild boars and deer, causing significant damage to farmlands. Motivated by a passion for matsutake mushrooms, a retired matsutake researcher and his friends created the Movement for Regeneration of Matsutake Forests 11 years ago. Their aim is to collectively regenerate a forest that had once been famous for its abundant matsutake, by re-planting pine trees and taking back the activities of forest management and re-construct the ideal environment for red pines and mushroom spores to meet and grow. Today, more than 30 volunteers, consisting mainly of retired men and women, gather to work together in the woods. Mai and I spent the morning helping to cook lunch for around 40 men that were managing different patches of forests nearby. We later learnt that they were clearing the forest top soil, cutting down broad-leafed trees and meticulously removing all fallen leaves to create a bare, nutrient-poor environment on ridges, which is the ideal setting for red pines to grow and establish a symbiotic relationship with the matsutake. After lunch, we were given a tour of their main forest activity plots. There, a lot of my idealized visions of satoyama and agroforestry had to be revised or at least questioned. How sustainable is it to intentionally create soil erosion and remove as much organic matter as possible? Should not high-organic matter and fertility always be the goal for agroforestry systems? What is a damaged landscape? There seems to be a more complex logic at play. Matsutake mushrooms are a mysterious gift from nature. It is only through the experiences of reconstruction through destruction of such satoyama forest communities, that life can be seen re-emerging from these forgotten landscapes. Their activities should not be romanticized, but seen as one of the possible stories to be told, a story of voluntary collective action, motivated by revitalizing the forest and celebrating a fruitful encounter of humans and nature – or multispecies assemblages. Or as said in their website, “calling back the abundance of Satoyama, giving the next generations a healthy red pine forest and cheerful woodlands”. In a few words, sato means “village”, or livable land, and yama translates into “mountains”. The concept of Satoyama is used to describe an area between human settlements and mountain foothills, a multifunctional landscape in which, according to the Japanese tradition, food is produced with the management of local natural resources (Morimoto, 2009, p.1). Being a term that co refers to a “holistic set of interlinked units, including, settlements, rice paddies, agricultural fields, bamboo forests, woodlands, and grassland” (Yokohari and Bolthouse, 2011). Tsing, A. L. (2015). The mushroom at the end of the world: On the possibility of life in capitalist ruins. Princeton, New Jersey: Princeton University Press. This entry was posted in RSO-student, Rural Development by Joost Jongerden. Bookmark the permalink.